What Do UCC AmeriCorps Members Do? 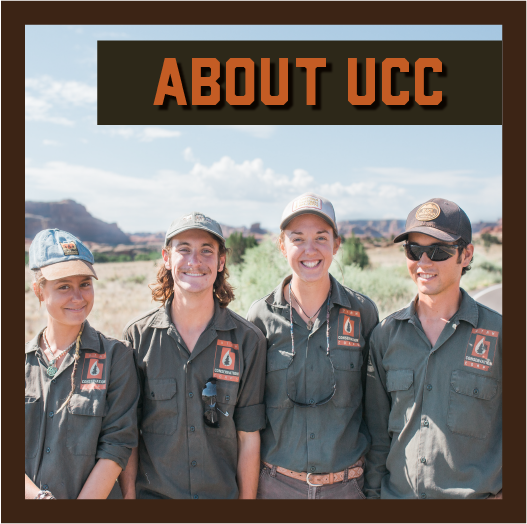 UCC AmeriCorps members primarily work on natural resource projects. These include invasive species removal, trail maintenance and construction, fence building, habitat restoration, and tree planting, among other projects. Members work in crews of four including one crew leader and work in a variety of habitats and locations. Where Do UCC AmeriCorps Members Serve? 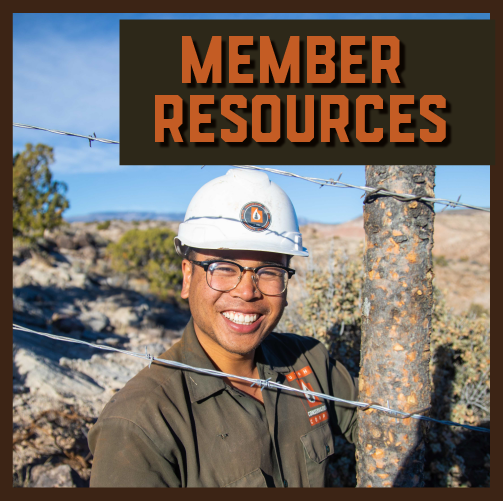 Members serve in locations throughout Utah, and occasionally Idaho and Wyoming. We serve in National Parks, National Forests, Wilderness areas, Bureau of Land Management Land, and private/state land. We work in all different environments, from deserts to rivers to high alpine forests. What AmeriCorps Positions Does The UCC Usually Offer, When Do They Begin And End, And When Are The Application Deadlines? The UCC offers 3 month, 6 month and 10 month positions (450,900, and 1700 hour AmeriCorps terms of service respectively). The 3 month positions are one season (spring, summer, or fall). Spring season runs February to June, summer season runs June to mid-August, and fall season runs from mid-August to mid-November. 6 month terms are two consecutive seasons, and the 10 month position runs from February to mid-November. For specific start dates, look through our Field Sections. These positions are for Crew Leaders and Crew Members, and you may choose which works best for you. Field Boss positions are required to be the 10 month position. All of these positions are approximately 40 hours of work per week. The UCC also runs many Individual Placement AmeriCorps Positions. These members work with various non-profit organizations throughout the state. For more information on these positions and their lengths of service, look under Individual Placements. Applications are accepted on a rolling basis and should be submitted two to three months prior to the start of the season you are applying for. Does The UCC Provide Residential Housing? No. While on hitch, UCC will provide camping accommodations. Some may be front country while some may be more remote backcountry sites. During off-time, members are responsible for finding their own housing. Logan: There are resources for free camping locations in Logan and a Recreation Center that provides showers at a low cost. Because Logan is a college town, there are many housing opportunities available. Splitting an apartment with other members can bring cost down. Use resources such as Craigslist or KSL, and check board postings on campus. Salt Lake City: Salt Lake has a large rental market. Most past crew members have either rented a place with other crew members or rented out a single room for the season. The best resources for rentals are Craiglist and KSL Classifieds. There are not many accessible campsites in the Salt Lake Valley so it is highly recommended that Salt Lake crew members figure out housing prior to the start of the season. Does the UCC provide a place for me to store my stuff while I am on hitch? The UCC does not provide a place for you to store your stuff while on hitch. You are responsible for storing your stuff whether in an apartment or car. If you do not choose to rent an apartment, it is HIGHLY recommended that you have a car. While on hitch, you may leave your car parked in our parking lot, however the UCC is not responsible for lost or stolen items. You also must leave your keys inside the UCC house (they will be locked) in case cars need to be moved. Can AmeriCorps Members Take Vacations During The Term Of Service? AmeriCorps Members have made a commitment to the Utah Conservation Corps and to complete their AmeriCorps term of service and with a certain number of hours. If timing and scheduling allows, time off is looked at on a case by case basis. It is the responsibility of the member to make sure any missed hours are made up. Time-off requests need to be submitted during the first week of training, and are not guaranteed to be granted. If hours are not completed, you will not receive your Education Award. Do AmeriCorps Members Need To Have A Car To Work For The UCC? Logan: The UCC provides all transportation to projects. We encourage AmeriCorps members to walk, bike and use public transportation (free bus system) to get around the Logan area. However, it is your responsibility to be at the office on time, ready to rig out for hitch. You SHOULD NOT be relying on other members’ vehicles for rides. There are a lot of awesome places within a few hours’ drive from Logan, and having a car is highly recommended. Salt Lake City: Salt Lake has a great transit system, with buses and trains running frequently in most parts of the valley (bus fare is not free in Salt Lake). It is also a bicycle friendly city with bikes lanes on most major roads. Many members have been fine without a personal vehicle, however, everyone is responsible for getting to the work truck every morning with all of their gear and should not rely on others for a ride. Does The UCC Supply Members With Health Care Insurance? The UCC only provides health insurance for members serving 1700-hour terms of service. All other members are responsible for their own health insurance. What is the Living Allowance For? UCC members receive a living allowance on a bi-monthly basis to cover living expenses such as food and housing. When Will I Receive My AmeriCorps Living Allowance Check? UCC members are paid through Utah State University payroll on the 10th and 25th of each month. What Gear Do AmeriCorps Members Need To Bring To Logan? All UCC members need to bring their own camping equipment. A warm sleeping bag (15-20 degree), sleeping pad, personal tent (good for backpacking if needed), a large capacity backpack, rain gear, 8” logger boots with a lug sole, water bottles etc. UCC provides cooking equipment (mess kit, stove etc. ), PPE (Hard hat, eye pro, ear pro, gloves, chaps, and a work shirt). What Clothing Do AmeriCorps Members Need To Bring? Members need to be prepared for a variety of weather conditions. Warm, quick dry clothing is recommended. Be ready for temperatures that hit or go over 100 degrees during the day and can drop to the 30’s or lower at night depending on where you are. Good rain gear is encouraged. UCC will provide long-sleeve work shirts that are required to be worn during your work day. You are responsible for purchasing sturdy workpants (Carhartts, Arborwear, Dickies etc.) that are brown. Do I need training to join? What trainings will I receive? To join the UCC as a member you do not need to have any previous training. Field work is a plus but certainly not required. The UCC provides a two week training at the beginning of each season. This will include a Wilderness First Aid through Desert Mountain Medicine, a trails training and chainsaw training. Food on and off hitch is NOT paid for by the UCC. Many UCC members are eligible for food stamps. Are Utah Conservation Corps Programs for Utah residents only? No, if you are a citizen of the United States and 18 years of age or older, you may apply. Can I apply if I am still a student? Yes, if you are 18 years and older, you may apply. However it is not possible to go to school while participating. The summer season is a perfect option for students wanting to serve. However, our fall and spring seasons will not work for those currently in school. Can AmeriCorps Members Take University Classes? Logan: No. Due to the time, place and length of projects, it is advised that UCC members not take university classes. How long will I be in the field for? Logan: Typical projects are 8 work days, with a travel day on either end. Typically, but not always, Crews prepare to leave for hitch on Monday morning, and return the following Tuesday to De-Rig. De-Rig consists of debriefing the week with a staff member, cleaning equipment, tools and the truck, and prepping for the next project. Some hitches are only 4 days, and some can be a few weeks in the backcountry without returning to town. This is all project dependent. Salt Lake City: Salt Lake crews generally serve close enough to the city for members to return home nightly, although crews have the possibility of going on hitch(refer to Logan for description of hitch). The typical schedule for a Salt Lake crew will be either 4 days, 10 hours a day with a 3 day weekend or 5 days, 8 hours a day with a 2 day weekend. Schedules may vary depending on projects. Logan: On any given work day, the crew will get up around 6, have breakfast, pack their bags for the day and have camp cleaned up by 7:00. At 7, you will do a stretch and safety circle with your crew to go over safety concerns and the hazards for the day. After that, you will head to your site and start work, whether you are driving there, hiking in, or working at your camp. You will work a ten hour day, taking two fifteen minute breaks and a thirty minute lunch. Crews will finish up the day’s work around 5:00 to allow time for cleaning tools or saws, and returning to camp. One crew member will generally cook dinner for the crew, you may have some down time to hike/relax/read etc. or the crew may do their education hours. Once dishes and camp chores are done, you are on your own. Any recreating that is done in the evening (hiking, wading, running etc.) must be approved by the Crew Leader and you must come up with an estimated return time. Camp is usually quiet by 9:00/9:30, when everyone is in their tents ready to sleep well. Salt Lake City: Crew members will generally meet at the work truck daily between 6:30- 7:00 a.m. From there they will perform a vehicle safety check, conduct and stretch and safety circle , load tools and supplies for the day and then drive to the worksite. Depending on the project, crews will work either eight or ten hour days, taking two fifteen minute breaks and a thirty minute lunch. Crews will finish up project work with enough time to maintain tools and drive back to the city. What are some opportunities after UCC? After UCC, many members continue to work in the conservation corps world, as crew leaders, field bosses and staff positions. 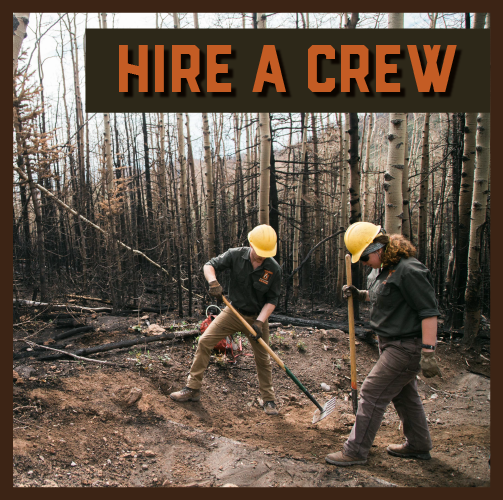 Throughout the season you will be working with many different agencies, and these provide great contacts for future jobs with the park service, forest service, Department of Natural Resources and BLM.